This is my last gluten-free bread, so I had to go out with a bang. (What, you thought I was going to end with another tapioca-starch-riddled flop? Feh!) This bread is absolutely amazing. It’s so fast, so good, and so endlessly customizable – you won’t believe it’s gluten-free! Personally, this wheat-addict can’t get enough of it. It’s called farinata (meaning “floured”), if you’re in Italy, and socca (meaning, um, “socca”), if you’re in France. I’m sure there’s some who will argue about minute and crucial differences between the two; but they’re basically the same thing, a thin bread based on chickpea flour and olive oil. Yes, that’s right: farinata is not only gluten-free, but dairy-free, nut-free, vegan, and I’m pretty sure it cleans your car and makes your bed, too. Farinata is a specialty of Northern Italy, mostly around Tuscany. 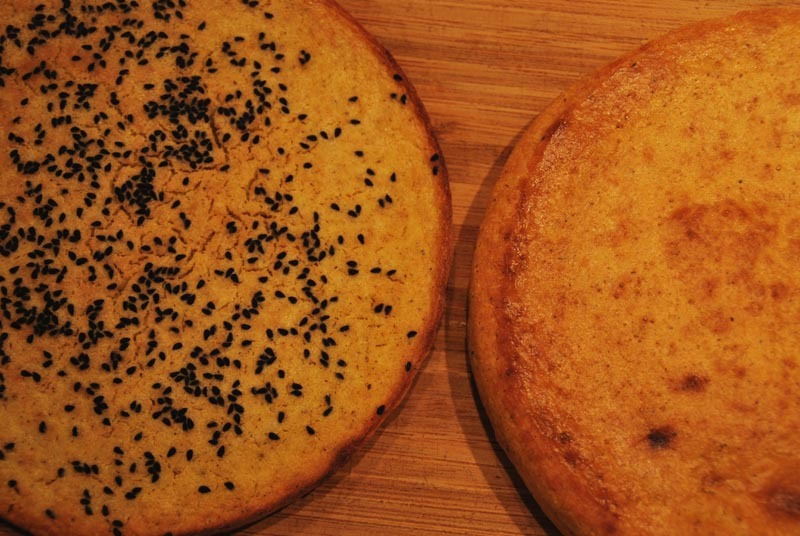 In France, you will find socca in the Southeast, but particularly in Nice. Often called “chickpea crêpes” due to the resemblance of the batter and cooking method, farinata differs from crêpes in that it’s seen in a variety of thickness, rather than the standard wafer-thinness of crêpes. Additionally, farinata is almost always served plain, with no toppings or condiments. Yes, it’s so good, you don’t need a thing to go with it (but it doesn’t hurt to serve it alongside something else, either). Usually heavily seasoned with black pepper, with or without a simple herb in the mix, farinata takes beautifully to any flavoring you like. Personally, I adore the punch and slap of black pepper, and the way it matches the spice of a good olive oil in the batter; but feel free to tone it down if you prefer something a bit milder. You can also match the flavors to any cuisine you like: use garam masala for an Indian meal, or cumin and cilantro for Tex-Mex, and on and on. I happened to find some nigella seeds at the Indian/Pakistani grocery where I bought the chickpea flour, so I snapped them up, and topped one of my farinata with them. (If you’ve never had nigella seeds, try them; they’re fabulous! They’re called “black cumin”, and do share some similarities, but don’t quite have the smoky depth of cumin.) The rich herb-y spice went fantastically with the bread, and the seeds gave a welcome texture as well. The variations are endless; but I recommend trying the classic recipe first. It’s quite peppery, but so, so good! This sort of bread is, I think, the key to good gluten-free baking. You’ll never be able to perfectly mimic wheat flour by using science-class ingredients, and I have been fairly disappointed with every try. (Plus, for someone who likes to eat as few processed foods as possible, it feels a bit wrong. I mean, what the frig is xanthan gum, anyway?) But by embracing different grains for their own, unique qualities, you might just find one that you love. Take chickpea flour, for example. We’ve all had chickpeas, right? And we’ve all had hummus, and it’s the best thing ever, right? But who knew you can make flour with chickpeas? Apparently, it’s a big thing in India and Pakistan, though, because it’s those grocery stores where you can find it most often, sometimes labeled “gram flour”. So you can’t eat wheat flour. Big deal! Yes, you’ll be missing out on some classics like a true French baguette; but you might not otherwise know about some equally delicious (if a little different in form) foods, like farinata, or almond-meal blueberry muffins. Being a celiac forces you to be a little more adventurous with your food, and forces you to make things from scratch a lot more – both of which I think are generally lacking in the American temperament, so I can’t help but appreciate that. I know avoiding gluten is rarely fun and games; but I believe in the virtue of hardship. You know, what doesn’t kill you only makes you stronger, necessity is the mother of invention, all that. While I’m grateful that I can eat gluten, I’m also quite glad that I experimented with gluten-free breads this week. It’s given me new appreciation for the hardships and hassle involved in gluten-intolerance, but it’s also brought me some great recipes. I hope you enjoy this one as much as I did! 1. Set an oven rack in the top third of the oven. Set a cast iron pan (see note 3 below) in the oven, and preheat to 475º F.
2. In a medium bowl, whisk the flour, salt, and pepper together. Add the water and 1/4 cup olive oil, and whisk until smooth. The batter should have the consistency of heavy cream. If needed, adjust with extra chickpea flour or with extra water. Cover with plastic wrap and let stand at room temperature for at least 30 minutes, or up to 3 or 4 hours. Any longer than that, and the batter should rest in the refrigerator, but can sit there for up to 24 hours. 3. Pour 1 to 2 tablespoons olive oil (depending on the size of the pan) into the hot pan. Carefully tilt the pan to coat with the oil. Pour the batter into the hot pan to the desired depth (see note 4 below). Keep in mind the bread will hardly rise in the oven. 4. Place the pan on the upper oven rack, and bake for about 5 minutes, or until firm to the touch. 5. Turn the broiler on, and broil for 3 to 4 minutes, or until the farinata begins to brown darkly in spots. Remove the farinata from the pan, and place on a wire rack to cool slightly. Repeat the oiling, baking, and broiling procedure for the remaining batter. Cut into wedges, or irregular shapes, and serve immediately. Farinata are best eaten fresh and warm, but may be cooled and frozen, wrapped tightly. 1. Though I usually give amounts in weight, not volume, I’ve given the volume measurement for the chickpea flour because it measures in a cup relatively well, and because the hydration level can vary pretty widely, and still produce a good bread. 2. No matter what anyone says, you can absolutely produce good farinata without a wood-burning oven. No, it won’t be as smoky; but it still tastes really, really good. It’s a conspiracy from Big Wood Oven, I tells ya! 3. You can use any size cast iron pan. Cast iron will best retain heat, and produce the best result, but if you don’t have one, or if you would prefer a giant, thin bread, you can use a pizza pan with a rim. A cake pan will also do the trick. But if you don’t have any of those, a rimmed baking sheet will do if all else fails; it will just end up rectangular. In any case, you should heat the pan up with the oven. Be warned that the high heat may warp a metal pan. 4. You can make the farinata any thickness you like, from crêpe-like thinness, to a hearty half-inch thickness. Generally, though, farinata are on the thinner side, and will cook more evenly as such. For thick farinata, you may want to reduce the oven temperature to 425º F.
5. If you have more than one pan, you can absolutely cook more than one at a time. 6. If you want to sprinkle seeds or other flavorings on the top of the bread, you should do so after pouring the batter into the hot pan. This turned out fantastic, though it confused my boyfriend. He was excited it was gluten-free so he could take a batch to game night with his glutenless friend.